Hubert, Thibaut d’ & Alexandre Papas (eds.). 2018. Jāmī in regional contexts. The reception of ʿAbd al-Raḥmān Jāmī’s works in the Islamicate world, ca. 9th/15th-14th/20th Century (Handbook of Oriental Studies. Section One, the Near and Middle East 128). Leiden; Boston: Brill. 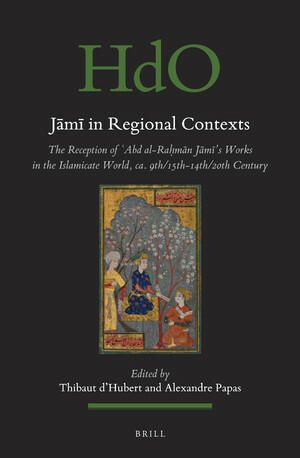 Jāmī in Regional Contexts: The Reception of ʿAbd Al-Raḥmān Jāmī’s Works in the Islamicate World is the first attempt to present in a comprehensive manner how ʿAbd al-Raḥmān Jāmī (d. 898/1492), a most influential figure in the Persian-speaking world, reshaped the canons of Islamic mysticism, literature and poetry and how, in turn, this new canon prompted the formation of regional traditions. As a result, a renewed geography of intellectual practices emerges as well as questions surrounding authorship and authority in the making of vernacular cultures. Specialists of Persian, Arabic, Chinese, Georgian, Malay, Pashto, Sanskrit, Urdu, Turkish, and Bengali thus provide a unique connected account of the conception and reception of Jāmī’s works throughout the Eurasian continent and maritime Southeast Asia.